Marinus Boezem, Labyrinth, 2016, fabric, aluminum, fans, 177 x 36'. Marinus Boezem has long harbored a passion for Gothic architecture. One of his well-known works, The Gothic Growing Project, 1978–87, is a grove of poplar trees whose arrangement reproduces the plan of the Reims Cathedral. The recorded sound of the wind among those poplars can be heard now, in an actual Gothic cathedral, in Transformation, 2016. 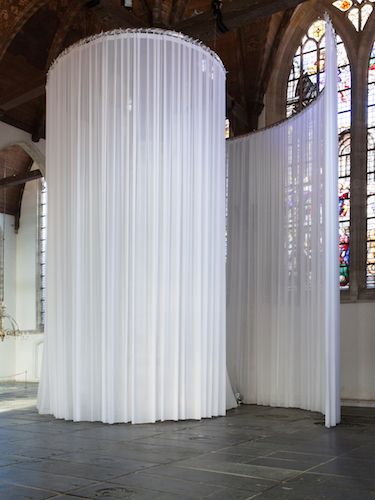 Installed in the magnificent Oude Kerk in Amsterdam, the show alternates Boezem’s pieces from the 1960s with his new creations. The artist takes a sensitive, measured approach to the solemn site, and the works, even when large in scale, have a delicate touch: an aerial architecture of white veils wafted by fans (Labyrinth, 2016); shattered mirrors on the floor (Meteorites, 2016); a large sheet stretched out on a table, at which a group of parishioners spend several hours a day embroidering the plan of the cathedral, evoking the collective but anonymous nature of medieval craftsmen (Gothic Gestures, 2016). In this context, even Boezem’s earliest works, which are dryly conceptual, are charged with poetic resonance. For example, the wind report (Windschaal / Wind Scale, 1968), which was included in a landmark 1969 exhibition titled “Op Losse Schroeven” at the Stedelijk Museum, here seems to speak of a pneuma, or spiritual breath, like the sound of the wind recorded among the columns. Into the Air, 2016, instead, is subtly blasphemous and consists of a hoist that lifts viewers up to just beneath the vaults of the cathedral, allowing them a viewpoint that the Gothic architects reserved for God. (Boezem has hung a text up there, which warns whoever ascends: “Wait until you hear from me.”) After standing in line for my turn in the hoist, I backed out at the last minute. The official reason was my fear of heights; in reality, it was my fear of divine punishment.